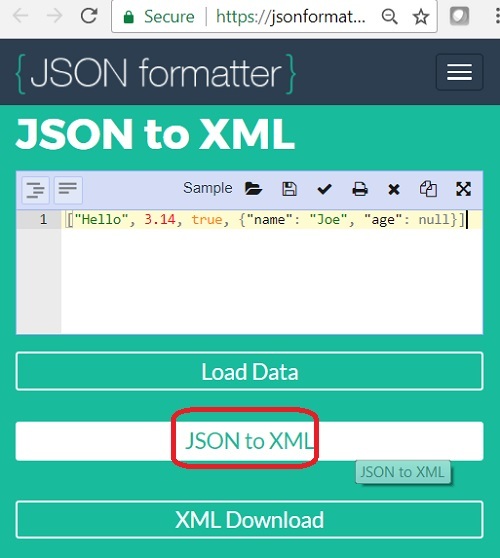 How to use the JSON to XML Conversion Tool at jsonformatter.org? 1. Go to the JSON to XML Conversion Tool page at jsonformatter.org. No root tag is added, which makes the output as an invalid XML. "0", "1", ... are used as the tag name for JSON array element, which are invalid in XML format. JSON Null value is converted to an empty text content element. So the JSON to XML conversion tool at jsonformatter.org is not good.